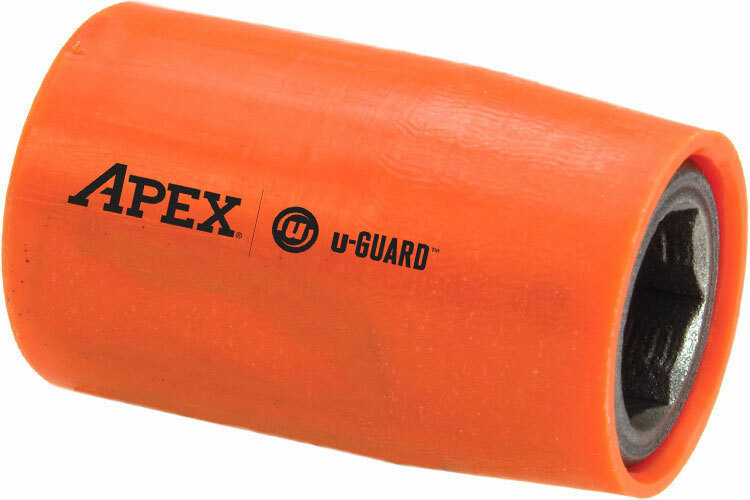 Apex u-Guard sockets feature a free-spinning design that provides maximum protection for polished and highly sensitive surfaces. The Apex u-Guard provides a protective barrier between genuine Apex Fastener Tools and your finely finished workpiece. Apex u-Guard sockets have hex tolerances that are on average 48% tighter than DIN and 35% tighter than ANSI requirements. With Apex you are assured of an exact, sure fit. All Apex sockets have the tightest tolerances for straightness and concentricity in the industry. Apex industrial grade impact sockets are available in a wide range of lengths and wall thicknesses, and with single or double hex openings. The UG-5110-D Apex 1/2'' Square Drive Socket, SAE is one of thousands of quality tooling products available from MRO Tools. Please browse Apex u-Guard Sockets, 1/2'' Square Drive, SAE for tools similar to the UG-5110-D Apex 1/2'' Square Drive Socket, SAE. UG-5110-D Apex 1/2'' Square Drive Socket, SAE description summary: Apex 1/2'' Square Drive Socket, SAE. Fastener End Size (in. ): 5/16'' Fastener End Shape: Double Hex Overall Length (in. ): 1.53'' Overall Length (mm): 38.9mm Drive Size: 1/2'' Square Drive Quantity discounts may be available for the UG-5110-D Apex 1/2'' Square Drive Socket, SAE. Please contact MRO Tools for details.